Eurocom Corporation (www.eurocom.com), a leading developer of high performance Mobile Workstations and Fully Customizable Notebooks is now shipping a computer system with full server capability combined with full mobility. The EUROCOM Panther 5.0 Server Edition is the 4th generation of Eurocom Mobile Server powered by Intel Xeon processors, continuing the tradition of highly capable, stable, upgradeable and expandable server grade hardware from Eurocom. The EUROCOM Panther 5.0 SE provides fast deployment right out of the box, combined with easy relocation. The ability to hand carry the system make the EUROCOM Panther 5.0 SE an extremely easy system to travel with while providing server capabilities. Unlike conventional servers the EUROCOM Panther 5.0 Server Edition weighs just 12lbs/5.5kg, measures just 419(W)x286(D)x57.9-62.1(H)mm (16.76x11.44x2.31-2.48inch) and is equipped with an integrated keyboard, 17.3” LCD Display, touch pad and Uninterruptible Power Supply (Battery Pack) making the Panther 5.0 perfect for on-the-go deployment. The EUROCOM Panther 5.0 Server Edition with Microsoft Windows Server 2012 provides extra virtualization capability, allowing higher performance, low cost computing through virtualization on one platform. Server-on-the-Go is a new category of server class notebook form factor computer. The All-in-One compact design, single computer solution allows for server capability anytime, anywhere. Server-on-the-Go allows for either “on-the-go”, “rapid server deployment” or “Ad Hoc” (temporary network setup) when single server capability is required, multiple operating system compatibility is needed and running virtual machines is a must. A Server-on-the-Go solution is perfect for software and database developers, training centers, military personnel, manufacturing, marketing and trade shows, emergency relief and service organizations. Fast deployment, right out of the box, combined with easy relocation and the ability to hand carry the system make the EUROCOM Panther 5.0 SE an extremely easy system to travel with while providing server capabilities. The EUROCOM Mobile Server solution significantly reduces the time and cost of deploying short-term LAN based solutions and of extending the usage of existing business applications to users wherever is required. Taken together, these qualities overcome the bottlenecks of traditional rack mount servers. Unlike conventional servers the EUROCOM Panther 5.0 SE is equipped with an integrated keyboard, LCD Display and Uninterruptible Power Supply (Battery Pack). A Polymer Smart Lithium Ion, 78.44 WH, 8 cell battery provides the backup power, allowing for safe shutdown during prolonged blackouts and for continued use during short power outages. Like all EUROCOM systems, long stable life spans of the system are attained by incorporating advanced cooling technology to ensure the system does not overheat. With the long list of highly capable components the EUROCOM Panther 5.0 SE is kept operational by having four large cooling fans pass air through the systems heat sinks. This cooling system disseminates heat through the rear of the system, away from the operator. Windows Server 2012 is the sixth release of Windows Server and succeeds Windows Server 2008 R2. 2012 has several added features over 2008 R2, such as an updated version of Hyper-V, an IP address management role, new Windows Task Manager and ReFS, which is a new file system intended for file servers that is an improvement over NTFS. Windows Server 2012 provides extra virtualization capability, allowing higher performance, low cost computing through virtualization on one platform. It allows for development of images of virtual machines and porting them to production servers. Hyper-V allows for network virtualization, multi tenancy and storage resource pooling. 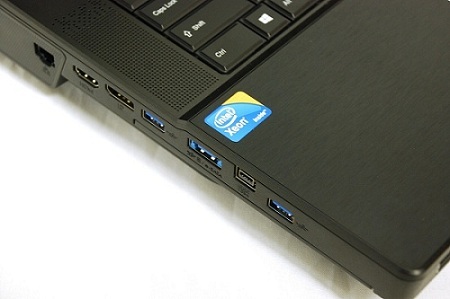 The EUROCOM Panther 5.0 Server Edition is a heavy duty Intel Xeon based super-computer class laptop designed for Server On-the-Go deployment. It is powered by Intel's family of Xeon E5-2600 series 6- and 8-cores processors, capable to deliver server class performance in a small and compact 12lbs/5.5kg package running major Microsoft Server 2012. Panther 5.0 Server Edition is an All-in-One server solution complete with integrated keyboard, 17.3” LCD Display and built-in UPS (Uninterruptible Power Supply). “The Panther 5.0 SE is perfect for organizations relocating operations that require fast network setup to eliminate staff downtime. To startup companies having an entire network server, for 20-50 users, running in one box. We also have customers who use our mobile servers as backup in case their production server goes down, they can load the virtual machine on to the mobile server for production purposes while the main production server is down. The more professionals we speak with about the Panther 5.0 SE the more creative and beneficial uses we see” Mark Bialic, Eurocom President. III. SATA 3 (6 Gb/s) storage. Up to four 2.5” HDD, SSD and Enterprise SSD drives in RAID 0/1/5/10 for up to 4 terabytes of storage. VI. 1 Gigabit LAN on-board, second network adaptor available through ExpressCard/ 34 slot; fiber optics available via ExpressCard 54 slot; Quad Port Ethernet Adapter available via ExpressCard/34 and MagmaBox. The Panther 5.0 SE comes with an Intel® 82579V Gigabit Ethernet port for greater compatibility with modern server operating systems such as Windows Server 2012. A second LAN adapter can also be added via the ExpressCard slot or a quad port LAN through the MagmaExpress Box. Additional LAN capability can be added through the ExpressCard slot itself, while also allowing connection to a MagamExpressBox for even greater LAN capability. The expandability of the Panther 5.0 SE allows it to accommodate additions to its capacity and capability. The ExpressCard technology is designed to deliver high performance, modular expansion. The Panther 5.0 SE is able to accommodate wired and wireless communications, multimedia and security features through the ExpressCard slot. The Panther 5.0 SE also supports storage expansion through the Optical Drive bay as it can be swapped out for an additional storage drive or can be used to backup data through the BluRay burner. Storage can be expanded through the eSATA port to an external storage medium as well. Mobile broadband capability (3G, 4G) can also be added internally for wireless internet access on the go or for Ethernet Network Analysis. EUROCOM Panther 5.0 SE uses quad channel memory, and enables the Panther 5.0 SE to initially support up to 32GB of DDR3 1600MHz RAM via four 8GB SODIMM 204 pin modules. With such massive amounts of RAM available, the Panther 5.0 SE becomes a great tool for virtualization and server class environments. The system is capable to support 64GB - this option will be available in the future once memory vendors release their 16GB single SODIMM module design. The EUROCOM Panther 5.0 SE is driven by a complete line of optional 6 and 8 core Intel Xeon E5 Processors, based on the LGA 2011 processor socket. The top of the line Intel Xeon E5-2690 has 8 cores, 16 threads, 20 MB of L3 cache, running at 2.9 GHz, supports Intel vPro Technology, Intel Virtualization Technology, Intel Hyper-Threading Technology and Intel Virtualization Technology for I/O. Eurocom is a leading developer of long lifespan, fully upgradable notebooks, high performance mobile workstations and mobile servers, since 1989. Eurocom has produced many firsts and continues to engineer solutions that inspire and enable individuals and companies to reach great possibilities. For more information on Eurocom please visit www.eurocom.com.